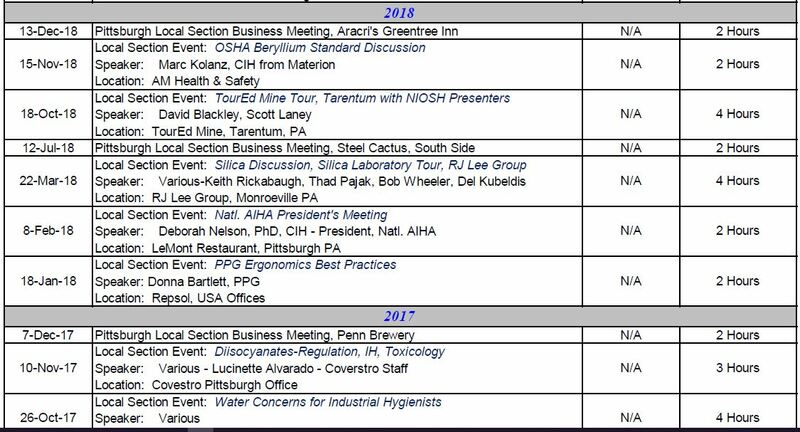 Throughout the year, the Pittsburgh AIHA provides quality programs and events on a variety of Industrial Hygiene related topics. These events are coordinated through the efforts of the Executive Committee and are open to Local Section Members and non-members alike! Your participation and attendance is the best way to support the local section and is key to our success, and the future of the Pittsburgh AIHA! We are always looking for input on meeting topics, potential speakers, event ideas, venues, etc. If you have a suggestion, complete the suggestion form at the right. Certification Maintenance (CM) points have been awarded by the American Board of Industrial Hygiene (ABIH) for the following Local Section meetings and/or seminars. Note: 0.5* CM points per 3 dinner meetings. About Certification Maintenance - Since 1979, the ABIH has required that all Diplomates participate in a Certification Maintenance (CM) program. CM is primarily focused on the continuous development of the industrial hygiene professional. Every 5 years, each Diplomate is asked to document that they have achieved at least the minimum level of experiences and education. These can take the form of work tasks, educational classes, conferences, committee work, presentations, teaching, authoring and even mentoring, to mention a few. For educational events, ABIH specifies that at least 10 CM points/60 hours per 5 year cycle must accrued in the IH rubrics, with at least 0.33 CM points/2 hours in the area of “ethics”. Other than that, the Diplomate may choose any activity that meets the criteria and rules of the Certification Maintenance Program Handbook. This freedom allows the CIH or the CAIH to better manage their career development according to their needs, e.g. practitioners with broad knowledge, or practitioners with deep, specialized knowledge. If you have questions about certification, contact the ABIH.